We’ve seen how to select document elements based on their tags, ids, classes and attributes. 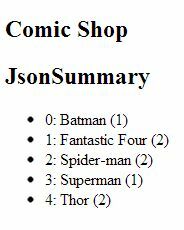 jQuery also provides a number of specialized selectors and filters. There are several ways of selecting elements based on their position in a list. The filters :first and :last (all filters begin with a colon (:)) select the first and last elements in the selected context, respectively. For example, if we wrote $(‘li:first’) we would select the first li element on the page (which is the Batman checkbox). Similarly, $(‘li:last’) selects Green Lantern. The :first and :last filters ignore the depth of nesting of elements and just pick out the absolute first and last matching elements. 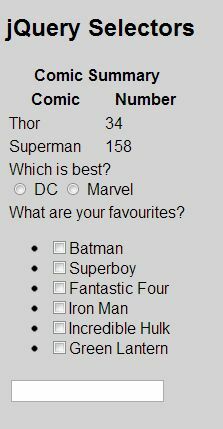 Thus $(‘label:first’) gives the DC radio button and $(‘label:last’) gives the Fantastic Four checkbox. If we omit a selector before the filter, jQuery uses the entire page as the context. Thus $(‘:first’) selects the <html> tag which encloses the whole page, and $(‘:last’) selects the text input tag at the bottom. The :first-child filter selects the first element in the context that is a child of another element. $(‘label:first-child’) gives the first three labels in the checkbox list because each of these labels is the first child of a li tag. Note that it does not include the DC radio button since, although this button is the first label child of the td tag, it’s not the first child: the br tag has that honour. If we delete the br tag, then the DC button is included; the text ‘Which is best?’ within the td does not count as a child since it just part of the td tag. As you might expect, $(‘label:last-child’) selects labels that are last children of another node. In this case we get the first three checkbox labels (since they are the only children, they are both first and last children) and the Marvel radio button. $(‘label:only-child’) selects labels that are the sole child of another node; here that means the first three checkbox labels. There are also filters :even and :odd which select even and odd elements from the context, using a zero-based index. 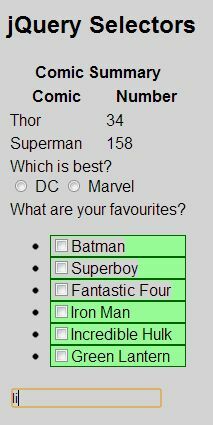 Thus $(‘li:even’) selects Batman, Fantastic Four and Incredible Hulk and $(‘li:odd’) selects Superboy, Iron Man and Green Lantern. We have :eq(n), :gt(n), and :lt(n) for finding elements that are at index location n, or greater than or less than n. Again, n is zero-based. Thus $(‘li:gt(2)’) selects Fantastic Four, Incredible Hulk and Green Lantern. Finally, there is the :nth-child(n) selector, which is a bit unusual, in that its index argument starts at 1 rather than 0. (This is for compatibility with CSS, but if you’re working with jQuery it can be a bit of a pain, since all the other index-based selectors start with a 0 index.) $(‘li:nth-child(2)’) gives Superboy. There are a couple of other versions of :nth-child(). One takes an argument of ‘even’ or ‘odd’ which returns the even or odd elements in the list, except of course because the list now starts with 1, these give complementary results to using just ‘even’ or ‘odd’ on their own. That is $(‘li:nth-child(odd)’) gives the same result as $(‘li:even’) and vice versa. The final form of :nth-child() takes a simple formula as its argument. We can write :nth-child(Xn+Y) where X and Y are integers. This will return every Xth element, starting with element Y. Thus $(‘li:nth-child(3n+2)’) returns every 3rd element starting with element 2, giving Superboy and Incredible Hulk. There are quite a few filters that do their selection based on the type or state of element you’re interested in. Filters that select specific types of element are :button, :checkbox, :file (equivalent to ‘input [type=file]’), :header (selects <h1>…<h6>), :image (same as ‘input [type=image]’), :input (any form input element), :password, :radio, :submit (same as ‘input [type=submit]’), :reset and :text (same as ‘input [type=text]’). These should all be fairly self-explanatory, but give them a try using the HTML above and the header block given earlier, and use the Console in Chrome or Firefox to see what you get. Somewhat more interesting are the filters that act on the state of an element. The :checked filter selects radio buttons or checkboxes that are checked. This seems a good place to introduce the tricky :not() filter. As you can guess, it returns the inverse of whatever selector is passed to it as its argument, but you have to be a bit careful. For example, you might think that since :checked gives all radio buttons and checkboxes that checked, :not(:checked) should give you all radio buttons and checkboxes that are not checked. In fact, what it does give you is all elements that are not checked, which means every element on the page (including non-radio buttons and non-checkboxes) except radio buttons and checkboxes that are checked. If you want just the non-checked checkboxes, you can write $(‘:checkbox:not(:checked)’), since that restricts the context to just checkboxes before applying the :not filter. If for some reason you actually do want both unchecked radio buttons and checkboxes, you can write $(‘:radio:not(:checked), :checkbox:not(:checked)’) being careful not to leave out the comma in the middle. The :contains() filter can also trap you. Its argument is some text, and it returns all elements that contain that text. The trap lies in the fact that if any element within the context is an ancestor of the element that contains the text, that element also gets included in the results. For example, if we wrote $(‘:contains(best)’), then the td element containing this text would be selected, but so would the html, body, table, tbody and tr elements that are that td’s ancestors. To get just the td element, we would have to write $(‘td:contains(best)’). If we want to select tag types that have another tag type as their ancestor, we have already seen that we write, for example $(‘tr li’) to find li elements that are children of tr elements. The :has() filter can do the inverse; it finds elements that have a particular type of element as a descendent. $(‘tr:has(li)’) returns the tr element containing the checkbox list. Again, note that the child element can be at any depth below the parent. The remaining filters are all fairly obvious. They are :disabled, :enabled, :hidden, :visible, :selected and :parent. The :parent filter returns elements that are parents, not the parents of elements. If you want to find the parents of a set of elements, you need to use the parent() function rather than a filter. Thus $(‘li’).parent() finds the ul element that is the parent of all the li tags. In the last post, we saw how to select page elements by searching for tag names. Sometimes, we’d like to select elements based on other criteria. There are several ways of labelling or marking tags. First, a tag may be given an id attribute. The HTML standard specifies that no two visible page elements may have the same id. The key word here is ‘visible’; you can define several page elements with the same id, so long as only one of them (or none of them) is visible at any given time. In the example above, we’d added an id to each of the th tags in the table. Secondly, most page elements can be assigned a class to which they belong. The name ‘class’ is a bit misleading if you’re familiar with object oriented programming, since an HTML class doesn’t have many of the properties of a true OOP class. In HTML, a class is really little more than a label which can be used to identify groups of tags on a page. In the above HTML, we’ve assigned all the td elements to have the class ‘cell’. Unlike the id, the class of a tag need not be unique; in fact, it usually won’t be, since the idea is normally to identify a set of tags that have a common property. A tag can belong to more than one class. In the above code, the th tags are members of both the ‘header’ and ‘cell’ classes. To define multiple classes, we list the class names separated by whitespace. Both the id and class can be any valid string. Finally, many tags have various attributes. Although these attributes are usually used to specify some properties of the tag, they can also be used as identification. Actually, both the id and the class are attributes, but there are many others for some tags. In the above example, the first th tag has a ‘colspan’ attribute, and the radio and checkbox input tags have ‘type’ attributes (the radio buttons also have a ‘name’ attribute). One of the most common uses of these ways of labelling tags is in specifying CSS rules, but we can also use them in jQuery selectors to pick out groups of elements on which we can act. Using the above page as an example (you can use the same head as the last section if you want to try this a live browser), we can see a few examples. To use an id, prefix the the id name with a #. For example, the expression $(‘#comicHeader’) will find the th tag with that id. Note that although ids must be unique amongst visible elements, it is possible that some currently hidden tags may have the same id, and this expression will find all tags that have that id, so you may need to filter the results to be sure of getting the one you want. If you want to restrict the search to tags of a certain name, simply prefix the id name with the tag name. Thus $(‘th#comicHeader’) will find all th tags with an id of comicHeader (which happens to give the same result as the earlier example in this case). It’s important to note that there is no whitespace between the th and the #. If you did put a blank between them, you would then be searching for descendents of a th node that had that id, which in this case would return an empty list. If you tried $(‘tr #comicHeader’), though, you’d then get the comicHeader node again, since it’s in a node which is a descendent of a tr node. You can search for several ids by separating them with commas. Thus $(‘#comicHeader, #numberHeader’) finds both th nodes with ids. Using the class as a search term is pretty much the same as using the id except you prefix the class name with a period (.) instead of #. Thus $(‘.cell’) finds all tags with a class of ‘cell’. Somewhat counter-intuitively, although you can define a tag that belongs to two classes by listing the class names separated by whitespace, if you try finding all tags that belong to both of two classes in the same way, you are doomed to fail. For example, the query $(‘.header .cell’) returns an empty list. What this query is really asking for is a list of elements with a class of ‘cell’ that are descendents of a tag with class ‘header’. Thus if we tried $(‘.headerRow .cell’) we’d then get the two th tags with a class of ‘cell’. If you do want a list of tags that belong to both of two different classes, you have to leave out the whitespace. Thus $(‘header.cell’) will give you the two th tags again. You can combine ids and classes in the same search. Thus $(‘#comicHeader.header.cell’) looks for tags that have an id of comicHeader and classes of both ‘header’ and ‘cell’. Finally, you can use any attribute as a search term. The syntax for this encloses the attribute and its value in square brackets. For example, to find all checkboxes, we can use $([type=checkbox]). We’ve left the quotes off ‘checkbox’, but in fact it doesn’t seem to matter whether you use them or not; thus $([type=”checkbox”]) also works. You can also search for tags that merely have a given attribute, regardless of what value that attribute has. For example, we can get a list of all tags that have ids by writing $([id]). The notation above for searching on id or class isn’t quite just a shorthand for using the id and class attributes though. The class has its own logic that allows things like multiple class definitions and searches, as we saw above. If we tried something like $([class=header]) we’d get an empty result. The attribute search attempts to match the exact string to the attribute, and there is no tag with just ‘header’ as its class, so the search fails. At the core of jQuery (as you might guess from its name) is its ability to search the web document in a myriad of ways. (It can, of course, do a lot of other things, but more on that later.) We’ll have a look at some of these search techniques here. Second, most jQuery functions are called from a wrapped set, do something to that set, and then return another wrapped set. Sometimes, the second set is the same as the first one (although with some modifications to its elements), but sometimes (as with a filter) the second set is a different set than the original, as it may contain different, or more or fewer, elements. Again, we won’t be worried about this much here, since we’re going to consider mostly just a single function that searches the page for specific elements. What we do with those elements is the subject of future posts. This assumes that you’ve got your CSS file in Content/jQueryDemo.css and that the jquery library is in Scripts/jquery-1.8.2.js. If you have a different version of jQuery or put your files in different places, you’ll need to modify those 2 lines in the header. If you’re using Visual Studio, you can include jQuery as described in the last post. As for the script in the header, don’t worry about it for now. Just be assured that when you type a query string into the text box and hit return, those page elements that you’ve selected will be highlighted in green. Also, if you’re running a browser (such as Google Chrome) that has a console, you’ll see the selected elements printed out in the console. To activate Chrome’s console, right click on the page and select ‘Inspect element’, then click the Console tab. This is well worth doing, since not all of the selected elements get highlighted, and it’s reassuring to see that these elements have in fact been selected. The 6 li elements have been highlighted. The reason that the top 3 don’t have their text highlighted is that these checkboxes are defined using the <label> tag, while the bottom 3 have a bare checkbox with some text after it. The label is a separate element that sits on top of the list, so it doesn’t get selected. Try typing label into the box and you’ll see just the top 3 checkboxes lit up, along with the 2 radio buttons. If you want to select both li and label elements, enter li, label. That is, a comma separated list will select all elements that match any term in the list. This form of list first selects the left-most tags (labels here) then selects children of those tags that satisfy the second condition. We could string together more tags if we have a deeper nesting on the page. Note that the input doesn’t have to be the immediate child of the label; if a label contains an input as its descendant at any point it will be selected. If you want to restrict your choice to only immediate children, you can write td > label. This selects label tags that are immediate children of td tags. This will give you the 2 radio buttons, but not the top 3 checkboxes, since they are buried inside a ul and li tag. To compare, try typing td label (without the >) and this time you’ll get the top 3 checkboxes as well. That’s about enough for a first post.